Fallout 4 comes with nearly limitless weapon combinations thanks to the new weapon modding feature that Bethesda implemented, but the truth is that most of the weapons in the game, even with the best mods installed, are not useful at all. Therefore, we decided to check out all the weapons in the game and find out which is the best weapon in Fallout 4… which is not an easy task and we can definitely not have a single weapon as an answer. If you played at least a bit, you already know that ammo is scarce and finding great weapons doesn’t happen that often. Play styles vary, Perks are different from player to player and all these are exactly what make Fallout 4 so amazing: you can have incredible success with a specific type of weapon if you adapt it to your play style and character build, while another player might consider it completely useless. Still, there are some weapons that are better than others and it’s them that will be placed in the “best weapon” category. Do have in mind that Perks and SPECIALs matter when it comes to the effectiveness of the weapons, as well as other boosts that you might get from Apparel, drugs or magazines read. It would be best to invest Perk points into that particular perk that increases the damage of your favorite weapons in order to get the most from them. Another important thing is that the unique weapons are usually preferred to regular ones, no matter how modded they are. These unique weapons usually do more damage – but they are also more difficult to get. In this article we’re only talking about the regular, non-unique weapons. 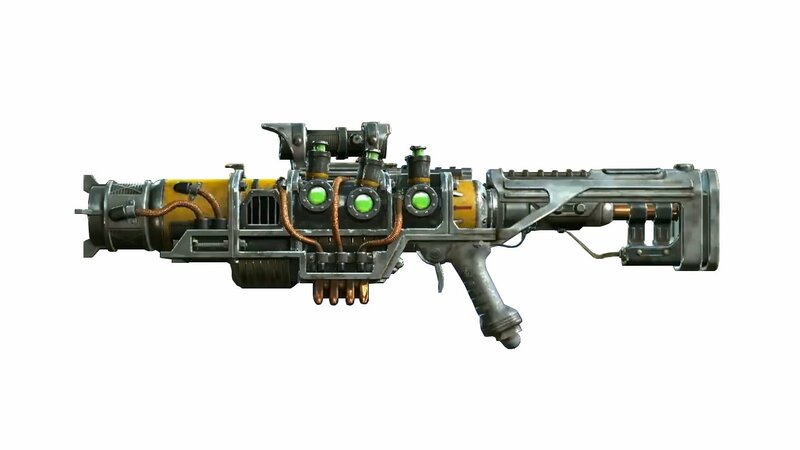 And let’s start talking – time to find out which are the best weapons in Fallout 4! Sledgehammer – the melee weapon used by most mutants is slow but causes a ton of damage. If you want to go with something faster and easier to use, I would recommend the Chinese Officer weapon. However, getting the legendaries or unique here is a must – the Power Fist rocks once you get it and causes a ton of damage. 10mm Pistol – although I don’t really like to use pistols because of their low damage, this is what you’ll be using most early on. The 10mm is the most common and that helps a lot: you get a ton of ammo for it and you can easily mod it to cause a lot of damage. It’s fast, it’s pretty accurate and I think it’s the best choice for a pistol, even if you manage to get your hands on a .44. Assault Rifle / Combat rifle – even though the two use different ammo, they are pretty similar and I love them both. They are, in my opinion, some of the best regular weapons in the game and great against more difficult enemies. Plasma rifle – this would be my choice for the best regular weapon in the game. You must upgrade it from a pistol and you can also turn it into a sniper rifle by modding, and it’s absolutely awesome against better enemies. My favorite weapons – only if finding ammo for it was easier/cheaper! You will not be able to always use the same weapon in Fallout 4, which means that you should adapt based on encounters. When you’re facing Bloatflies and even Ghouls, you can take them up with boosted pistols in order to save ammo from the rifles. But don’t go attacking a Super Mutant Brute with a 10mm! Switch to better weapons that cause more damage and take fire rate into account: with super mutants, you can even go for lower magazine weapons because they are relatively slow, but for groups the Assault/Combat/Plasma rifle are a must. As they are for legendaries or bosses. So these would be my recommendations for the best weapon(s) in Fallout 4. What’s your opinion regarding the best weapon?